e-olio - Page 2 of 2 - A miscellaneous collection of articles with no set theme. We left off last time finishing all the horizontal and vertical gimmies in the puzzle. These are the numbers that it takes little effort to find. Remember the technique (check rows and columns of containers for duplicates and then see if the remaining container has a unique position for the number in question) as you will use it throughout the puzzle solution. 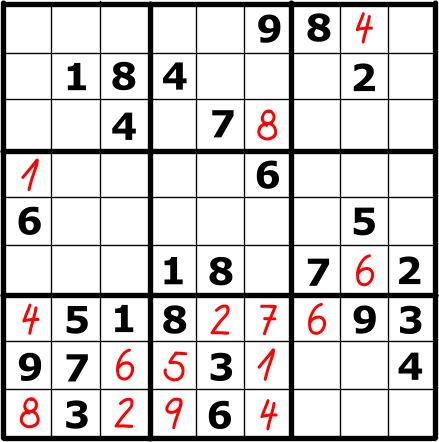 Every number you put into the puzzle should trigger another gimmie search in both the horizontal and vertical directions for the container in question. This is the second in a series about the Sudoku puzzle and some of the solution methods. In the last post the puzzle was defined and the rules for solving were shown. In summary, you have a 9×9 array of squares that have to be filled with numbers such that each row, column and container contain one through nine with no repeats. In case you have not seen anything about light field photography then you’ve got to take a look at the Lytro website for a new paradigm. The basics of light field photography have been around for some time now in the laboratory. Electronics have now taken the computing power out of the lab and put the processing on a chip. I’ve done some experimenting with it and have found it an interesting new concept but it’s at the introductory level right now. Picture resolution, for example, is only 1080 x 1080 pixels which makes it feel rather like the old Sony Mavica I started digital photography with back in 1998 or so.